making: ROBYN'S FETISH CHALLENGE #244 "ANYTHING GOES"
Good Morning on this last Sunday of this year. I can not believe that we will be starting 2015 this week. I have been wondering where this year has gone to. Did everyone have a great Christmas? Mine was good. Going to my son's house for dinner was different. The evening went great. All the kids faces were so adorable when they were opening presents. They didn't eat to much either with all the the toys that they had to play with. I tried to help with dinner and dishes but my son wouldn't let me. So I came home at the end of the evening and had nothing to do but sit and relax watching the lights on the tree. Wonderful!!! Well, we have a great sponsor this week. She is Stamp Art Design By Kathryne. Many designs for you to choose from if you win the challenge this week. The image that I used was Hollybelle. The image is an angel bear with some mistletoe and bells on her.I started on her last weekend with a great idea and started working in it. I had the image colored and the background for the bear cutout. Looking for a poem that I wanted to put on the page was hard to find. So I had to change my idea. That didn't work either then there was Christmas Eve and Christmas. So I finally made a card with some of the things I wanted to do on the layout. I want to show you my card but let me tell you about this great prize. Now let me show you what I ended up with. I think it turned out good after all my ideas. I just love this image. I will be figuring out the layout I had started to sketch but it might take me awhile. I'm sure you want to enter the challenge this week so you have a chance to win this little cutie. Here are the items that I ended up using. I hope you see you enter our challenge at The Robyn's Fetish Challenge Blog this week. 5 Digital Stamps would be great to win. I will see you in the next year and I hope you all have a great New Year's Eve and Day. Mine will be a relaxing one I hope spending my night with my children. 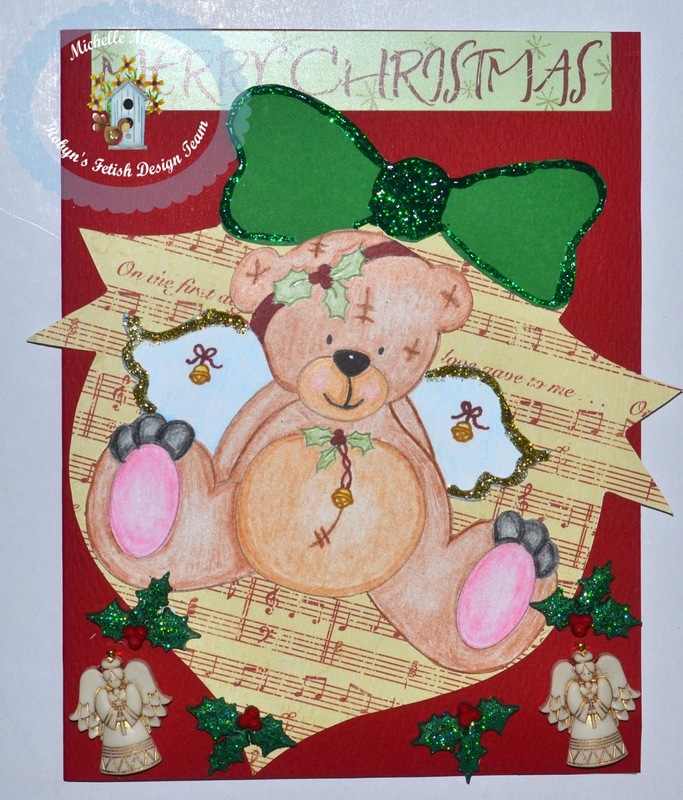 The bear looks so cute, great DT inspiration Michelle.